This versatile, rock-solid machine can tackle road paving or offset applications like barrier and variable barrier, bridge parapet, ditches, and more. The SF-2404 is the contractor’s solution to conventional paving, offset paving, and custom applications for residential and intermediate paving projects. Meet the #1 curb and gutter machine in the world – featuring industry leading productivity, compact size and impressive turning ability. We invented the first extruded curb machine in the world over 60 years ago, and our extruders still lead the industry today. Simple to operate and highly customizable, our slipform pavers are engineered precisely to maximize productivity on the job site. Your Single Source for Quality and Productive Paving Equipment. The ultimate in concrete slipform paving machines and equipment. Discover state-of-the-art manufacturing processes with superior engineering. Get great results with high-performance curbing equipment and low-maintenance machinery that keeps paving contractors profitable..
We are committed to our customers & their success. Our support team will do their very best to get you off to a great start. We consult with you during the buying process in an effort to help you select the power curbing and paving machinery and equipment. 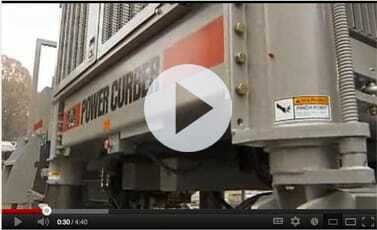 Power Curbers' 5700-C is the latest in the company's 5700 Series of curb machines. Like its popular predecessors, the 5700-C is known for its productivity and ability to turn a tight radius in a parking lot. Discover the difference our power curbing machinery and equipment make. We manufacture a full line of slipform concrete paving machines, form-riding pavers, belt placer/spreaders, and a texture/curing equipment for all your paving needs. We specialize in power curbing machinery paving equipment that will never let you down.